NASA's Solar Dynamics Observatory spacecraft took this image of the sun on July 6, 2016 while performing a seven-hour-long somersault maneuver. 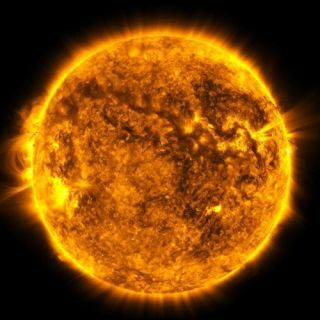 The sun appears to take a dizzying flip in a new video captured by NASA's Solar Dynamics Observatory (SDO) spacecraft . SDO did a full somersault on July 6 over the course of about 7 hours, taking pictures of the sun every 12 seconds all the while. These photos, which SDO team members combined into a video, are pretty wild. The video seems "to show the sun spinning, as if stuck on a pinwheel," NASA officials wrote in an image description Friday (July 15). The sun appears to do a somersault in these images captured by NASA's Solar Dynamics Observatory (SDO) spacecraft on July 6, 2016 — but SDO was the one doing the spinning. SDO does such a somersault twice a year to help its Helioseismic and Magnetic Imager (HMI) instrument take good measurements of the sun's outer edge. "Were the sun perfectly spherical, this would be a much simpler task. But the solar surface is dynamic, leading to occasional distortions," NASA officials wrote. "This makes it hard for HMI to find the sun’s edge when it’s perfectly still. HMI’s biannual roll lets each part of the camera look at the entire perimeter of the sun, helping it map the sun’s shape much more precisely." The $800 million SDO mission launched in February 2010 to help scientists better understand what causes variation in solar activity, among other things. The satellite's observations could aid efforts to predict the eruption of big solar storms, which can damage power grids on Earth and pose dangers to astronauts in space, NASA officials said. SDO has captured a number of stunning images during its six years in space. Just last week, for example, the satellite snapped a series of photos showing giant, dark "coronal holes" on the sun. In some of these images, the sun appeared to be making a nervous or anxious face, thanks to the fortuitous alignment of various solar features (and the human brain's tendency to find meaning and patterns in random data).